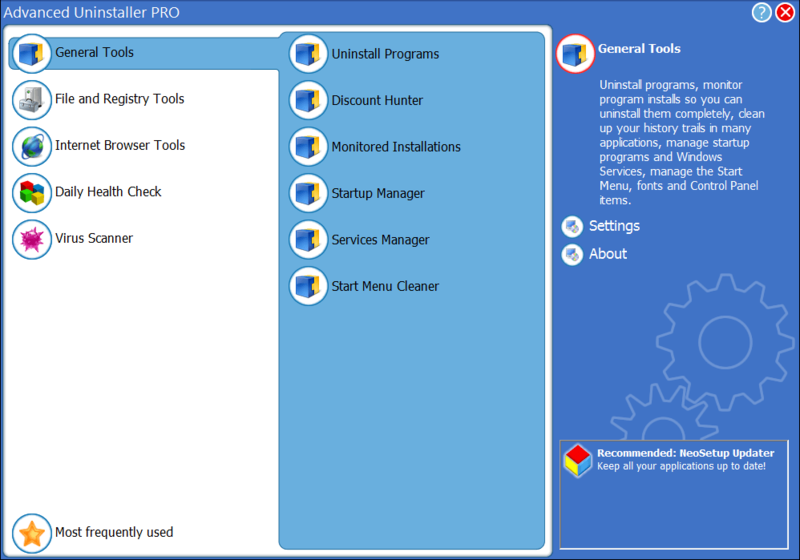 Advanced Uninstaller PRO’s built-in Startup Manager gives you control over the programs that are automatically started by Windows, and offers you detailed information about each of them, including advice about what the program does and whether you should disable it. Advanced Uninstaller PRO includes a huge knowledge base containing startup program descriptions, giving you the ability to distinguish between essential Windows components that you want to keep, and dangerous spyware programs that you want to remove. To protect your privacy, the Quick Cleaner performs a one-step removal of the data on your computer that tells other people what you’ve been doing. It can safely delete the list of Internet pages that you have visited, the web addresses that you have typed, the Internet cookies that were written to your hard drive when you visited web sites, and the recently opened files lists for more than 100 applications, including Microsoft Office, Windows Media Player, ICQ, MSN, WinZip, RealPlayer, Kazaa, etc. Advanced Uninstaller PRO runs under Windows 95 / 98 / Me / NT4 / 2000 / XP and Windows Vista, and may be purchased securely online by following the link on top of this page. Communicate with other users through our online forum. Easily ask questions, get useful answers and share your experience with a large community of users. The Mozilla Firefox tools have been added. The Installation Monitor will make sure that no file or registry entry will be left behind after the uninstallation of a program. This tool can watch a program’s installation, create an installation log containing information about everything that the setup of the program has done, and then later completely uninstall the program. You will be able to uninstall a program even better than by using it’s own uninstaller. More than this, we designed this tool to be fast and reliable. We honestly believe it to be one of the fastest tools available of this kind. As many of our users requested, the installation logs can now be printed. The program also supports a multi-language interface. More details by clicking here. When you spend days in from of your computer you save a lot of information for later use. You save documents, Internet pages, images, movies, and many more. The problem is that after some time you might end up saving the same file several times. The Duplicate Files tool allows you to scan your computer for duplicate files, zero-sized files and empty folders. This is a safe tool that makes sure that you do not delete all copies of the same file. The Services Manager tool allows you to easily take control of programs that are automatically started each time you use your computer. Services are important programs that are started before any other Windows program. They usually take care of networking, web publishing, firewalls, etc. We created a profiles list that contains the most important configurations that can be found today. When you first run the Services manager tool your initial configuration is added to this list so that in case you will make a mistake you will be able to restore your services’ settings to their initial state. We improved the Registry Cleaner. It will now perform a deeper search for more invalid registry entries and will do an even better job removing junk items and speeding up your computer. The ActiveX tool gives you control over the ActiveX programs (also called ActiveX web controls) that are downloaded by Internet Explorer from the web. Many applications you install on your computer can add menus that will appear when you right click a link, image or page in Internet Explorer. The only problem is that after installing a lot of programs you might end up with a cluttered right-clock menu that will make Internet Explorer difficult to use and run slower. You can now take care of this problem by using Advanced Uninstaller PRO! The scheduler will allow you to choose what tool will be automatically started each day of the week. In case you don’t want to use Advanced Uninstaller’s own skins, you are now able to set it to use the same theme as Windows XP. The main Advanced Uninstaller PRO window now saves it’s desktop position and size, making it more easy to customize.